Thank you Beech-Nut® for sponsoring this post—all opinions are my own! 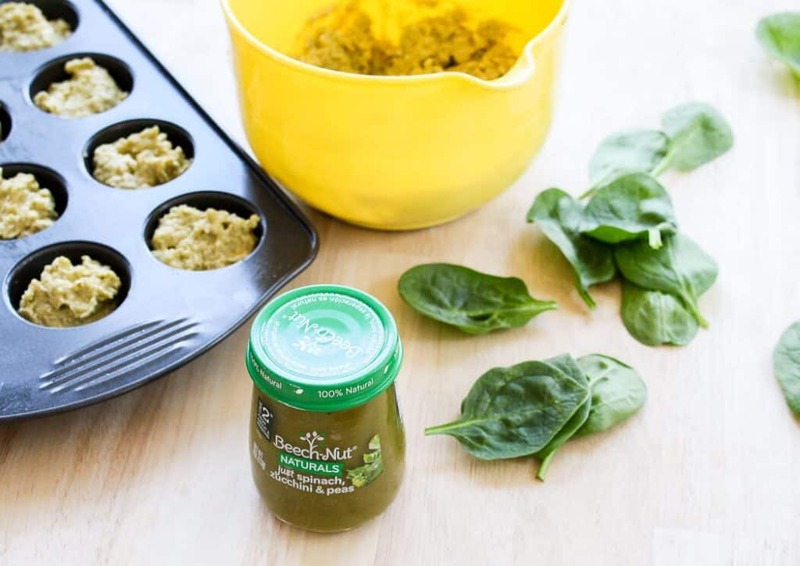 Wondering what it is like when using baby food while doing baby-led weaning? Then this post is for you! 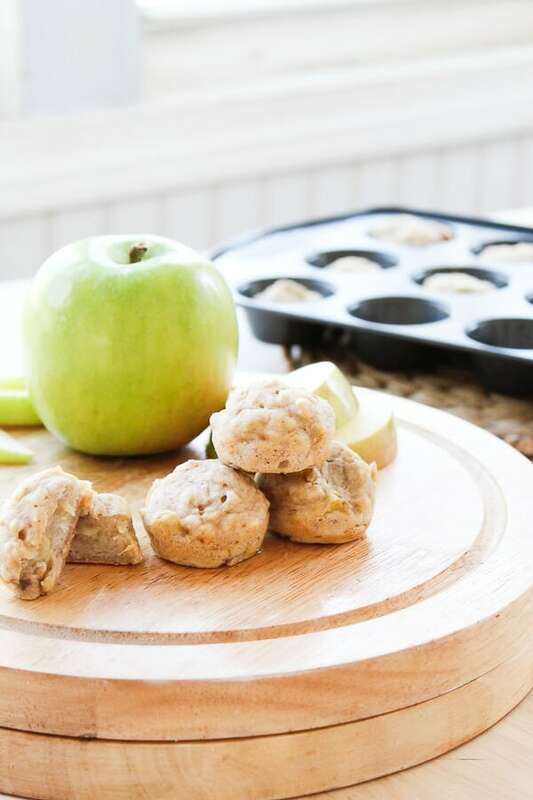 I’m sharing a few reasons I did a combination of both and an easy 3 ingredient baby led weaning muffin recipe that uses baby food as one of the ingredients! If you have been following along on Instagram, you have probably seen that I share lots of videos in my stories of Ensley eating— because that girl loves to eat! I’ve shared various clips or photos that have both baby food purees and regular food, and I’ve gotten questions about whether or not I’m doing one or the other. I actually do a combination of baby food purees and baby led weaning, and it works for me and my family. I know some people feel strongly one way or the other, but if you are curious about why we went this way, or are thinking about doing it yourself, then I wanted to share some of my reasons and thoughts! I knew this time around I was going to start baby led weaning earlier than I did with Charlie, but also really appreciate how easy baby purees are for introducing a wide range of foods. I was waiting for our Ellie girl to be able to sit up independently for her to start baby led weaning, but she was showing signs of readiness (opening her mouth when we were eating, stealing her sister’s food out of her hand and trying to eat it, etc) before that. I decided to let her explore the idea of food with purees in the meantime. 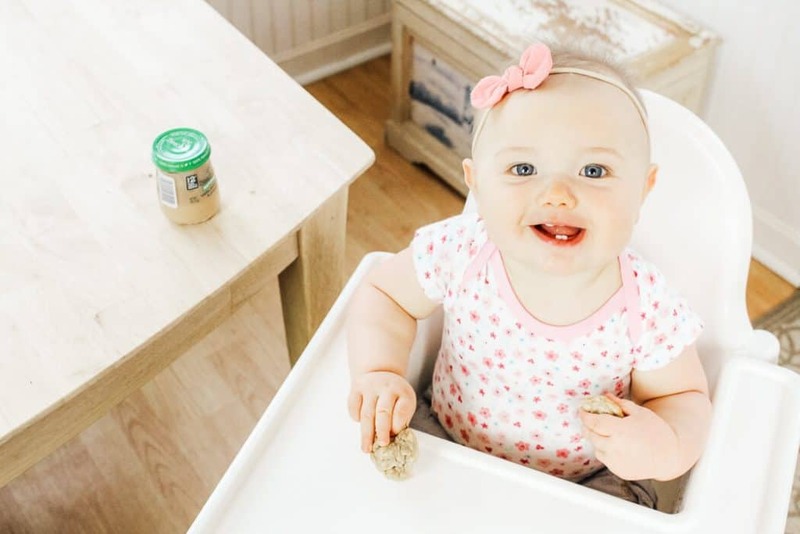 I used Beech-Nut® Naturals™ Stage 1 baby food as her first food when she was about 5.5 months old. I chose this specific food because it was important for me to have single, high-quality ingredients. She went crazy for the food! She loved it right from the start and was so receptive to different flavors. Some of her favorites were Beech-Nut® Naturals™ Just Butternut Squash (Stage 1), and Just Carrots (Stage 1). Single-ingredient was important for us at the start because it helped us see if she had any allergies or reactions to certain foods. She actually seemed to be sensitive to either some fruits or other purees with acidic preservatives, so it was easier to narrow down foods that worked well when there was strictly a food ingredient (such as carrots only without any artificial preservatives) and then working up to blends of two or more foods together. 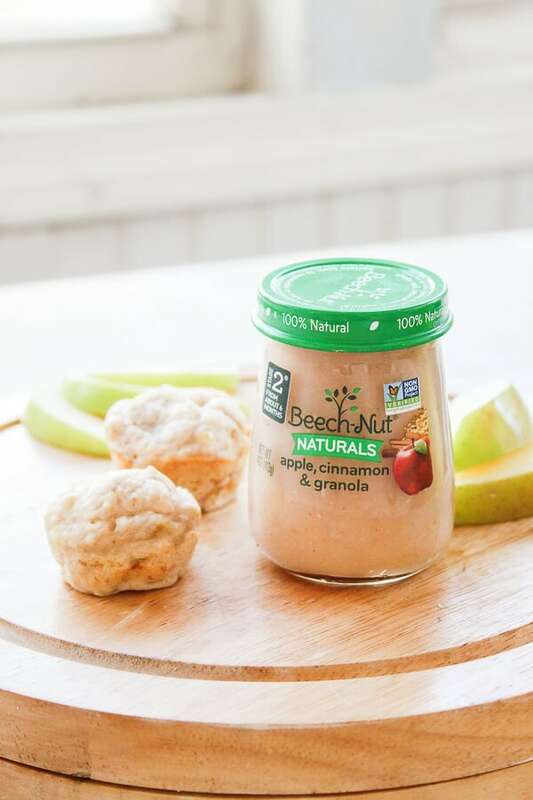 One of the reasons I chose Beech-Nut® Naturals™ was that it is made with real ingredients that are simply prepared. They contain real fruits and vegetables, without anything unnecessary or unnatural, and are gently cooked and pureed cold to preserve nutrients. Shortly after we started solids with purees, she started sitting up on her own and I started baby led weaning as well. However life with a toddler and a baby is hectic, and I continued incorporating purees because it worked for our family and because it let me try certain foods on her without having to spend extra time prepping (such as steaming apples or roasting sweet potatoes). Not only did we do a combination, but I started trying out different ways to create first foods using baby food. This is such an easy way to create fun table food for baby led weaning easily! Take these mini muffins for example—they are easy for Ellie to grab and eat, and super quick to put together. The bananas help bind the muffin mix together, and the combination of ingredients in the baby food give it a great flavor. 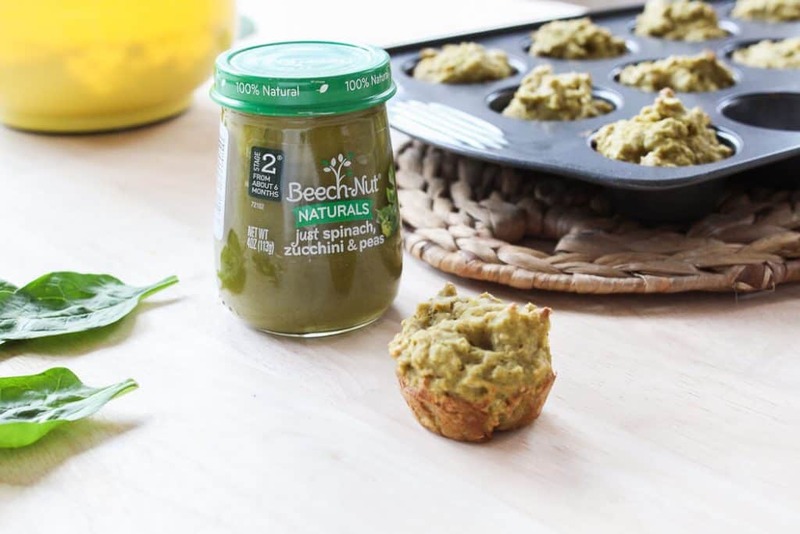 You can also use baby food as a base ingredient for other first foods, like baby pancakes, popsicles, or to create more savory foods like veggie muffins. These, for example, are made with Beech-Nut® Naturals™ Just Spinach, Zucchini & Peas (Stage 2), and quick oats. There are lots of choices out there for how to introduce solids to a baby. 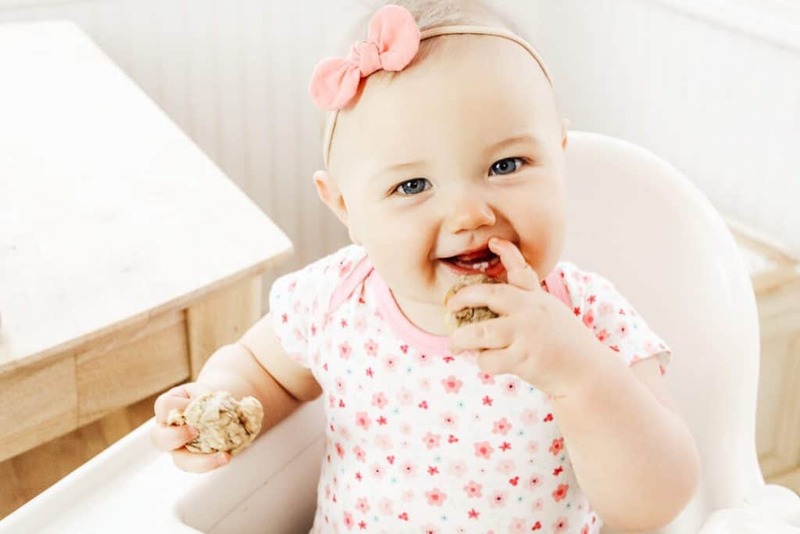 This is what has worked for my family, and it is a great way to ease into baby led weaning while still making sure your baby gets to try lots of different types of food. It is really important to read labels however—all baby food is not created equal! Simple is definitely better when it comes to ingredients! Have you used pureed baby food to make other food for your family? I’d love to hear about it in the comments below! If not, tell me what your experience introducing solids was like with your kids! Beech-Nut are one of the few brands mister can have with his allergies! Even at 3 he still loves the pouches!! What a sneaky way to get those babies to eat their veggies! I’ve tried hiding vegetable purees in smoothies, etc. for my older kids, but it never occurred to me to do it for a baby! And using ready-made baby food makes it easier – you get to skip the cooking and pureeing. And I do love Beechnut. 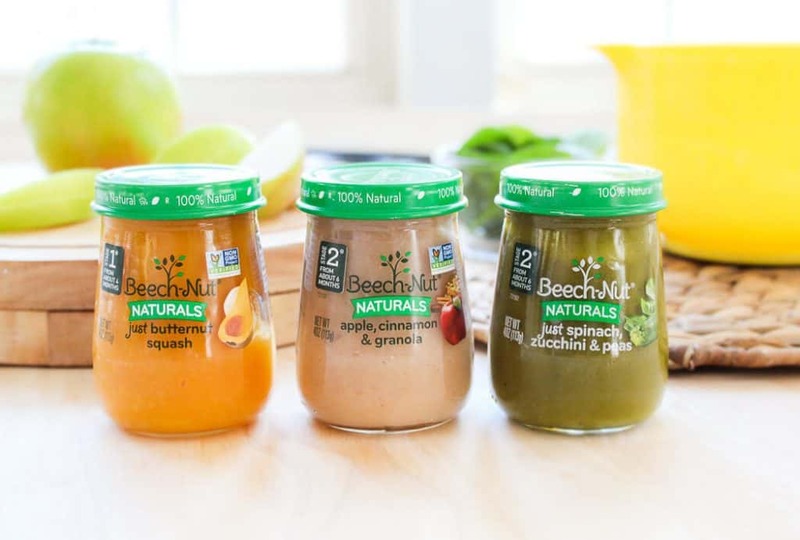 I usually only bought it when it was on sale, but I felt so much better about giving Beechnut to my baby than some of the other cheaper brands out there!